2 Tm 4:7. 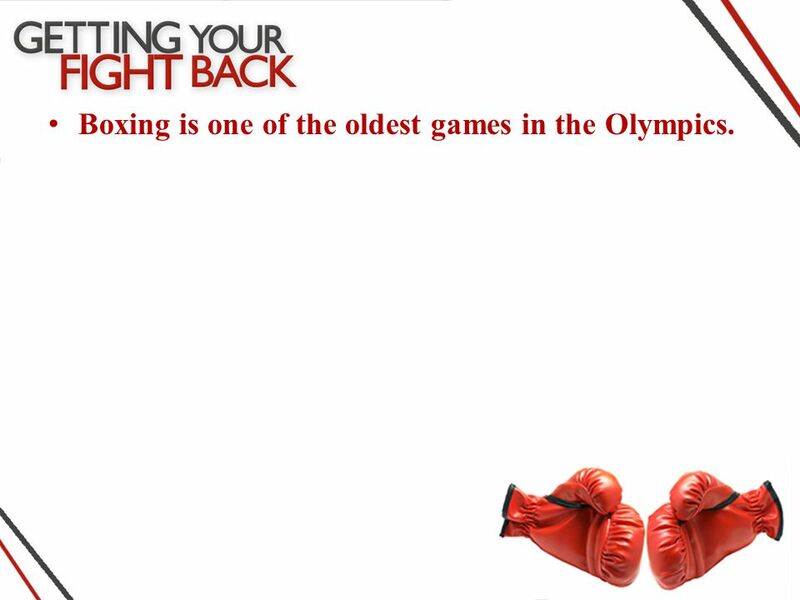 Boxing is one of the oldest games in the Olympics. 3 Boxing is one of the oldest games in the Olympics. 4 The organizers of the modern Olympics were worried because of the violent nature of boxing. 5 In tonight’s text, Paul speaks of Christianity as a fight. 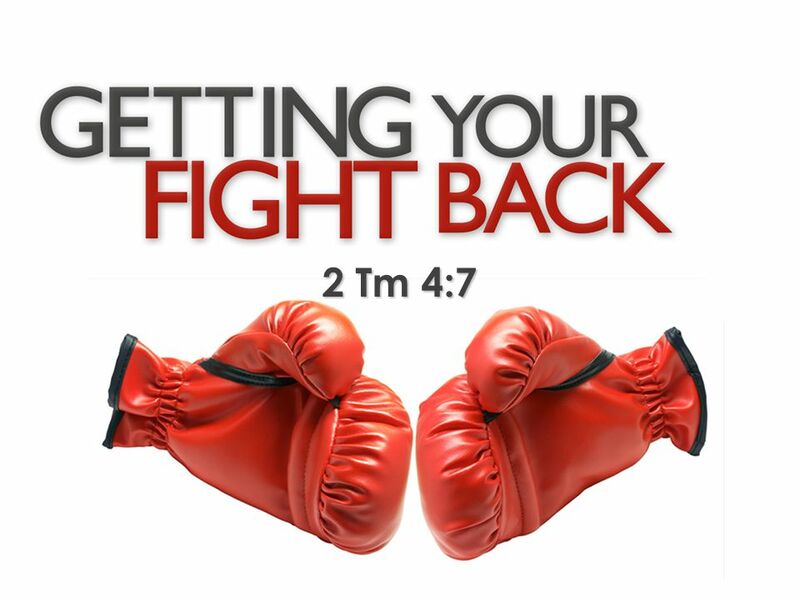 6 – “I have fought the good fight, I have finished the race, I have kept the faith” (2 Tm 4:7, ESV). 7 In tonight’s text, Paul speaks of Christianity as a fight. – “I have fought the good fight, I have finished the race, I have kept the faith” (2 Tm 4:7, ESV). – Christianity is often compared to a fight. 8 In tonight’s text, Paul speaks of Christianity as a fight. – “I have fought the good fight, I have finished the race, I have kept the faith” (2 Tm 4:7, ESV). – Christianity is often compared to a fight. “This charge I entrust to you, Timothy, my child, in accordance with the prophecies previously made about you, that by them you may wage the good warfare” (1 Tm 1:18, ESV). 9 In tonight’s text, Paul speaks of Christianity as a fight. – “I have fought the good fight, I have finished the race, I have kept the faith” (2 Tm 4:7, ESV). 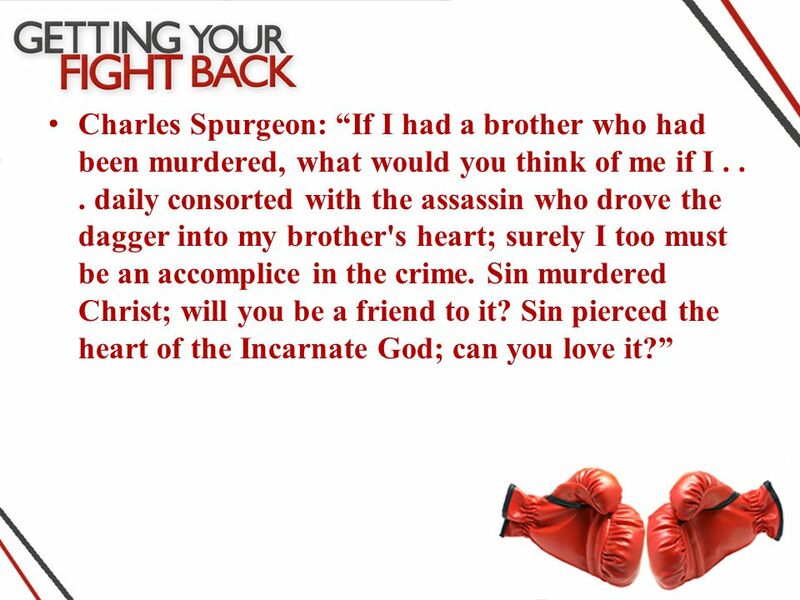 – Christianity is often compared to a fight. “This charge I entrust to you, Timothy, my child, in accordance with the prophecies previously made about you, that by them you may wage the good warfare” (1 Tm 1:18, ESV). “Fight the good fight of the faith. Take hold of the eternal life to which you were called and about which you made the good confession in the presence of many witnesses” (1 Tm 6:12, ESV). 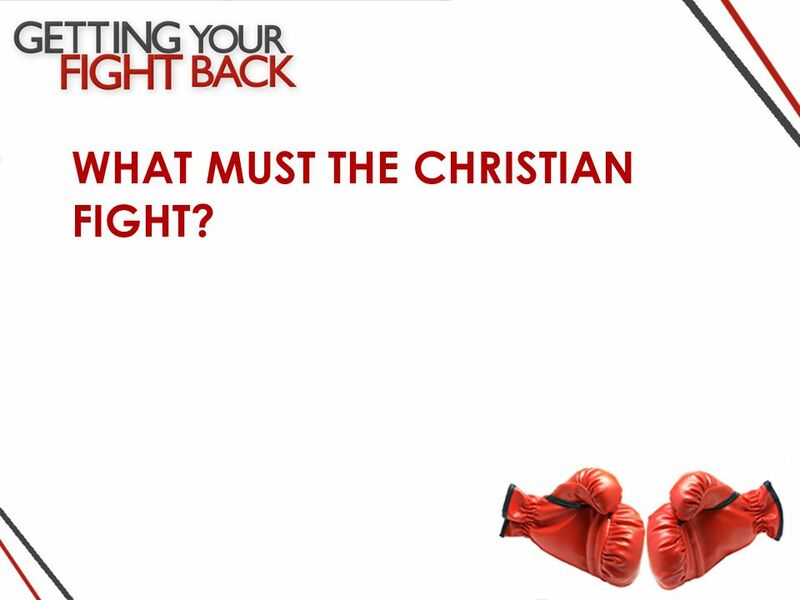 10 WHAT MUST THE CHRISTIAN FIGHT? 12 Temptation is the common lot of man. 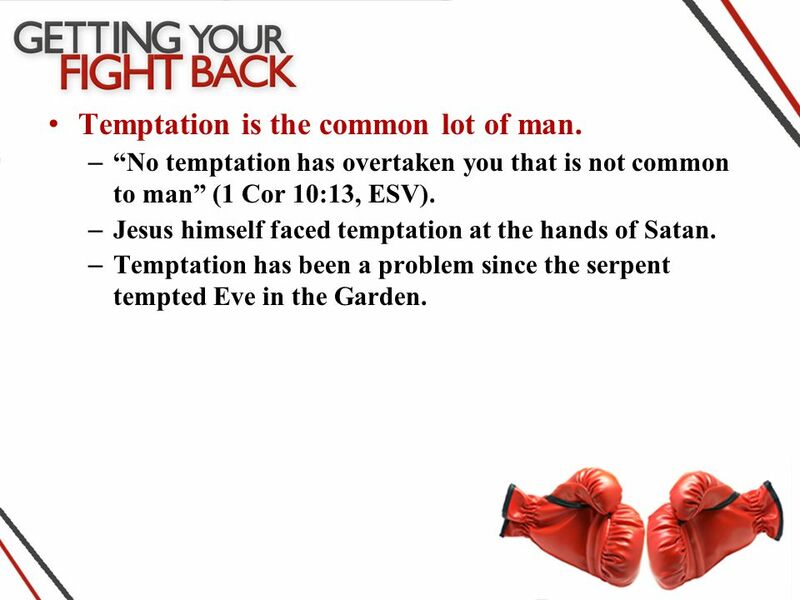 13 – “No temptation has overtaken you that is not common to man” (1 Cor 10:13, ESV). 14 Temptation is the common lot of man. 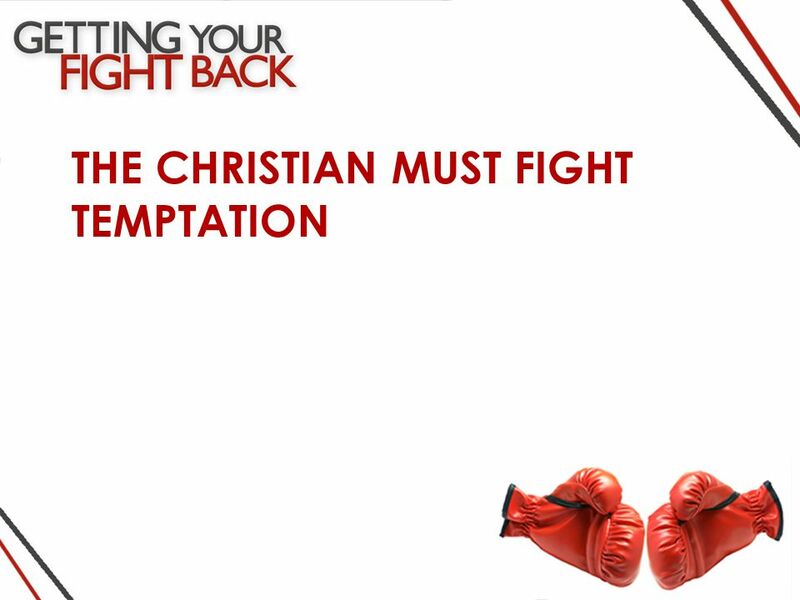 – “No temptation has overtaken you that is not common to man” (1 Cor 10:13, ESV). – Jesus himself faced temptation at the hands of Satan. 15 Temptation is the common lot of man. – “No temptation has overtaken you that is not common to man” (1 Cor 10:13, ESV). – Jesus himself faced temptation at the hands of Satan. – Temptation has been a problem since the serpent tempted Eve in the Garden. 16 JUST BECAUSE WE’RE TEMPTED DOESN’T MEAN WE CAN SIN! 19 “Again, the devil took him to a very high mountain and showed him all the kingdoms of the world and their glory. 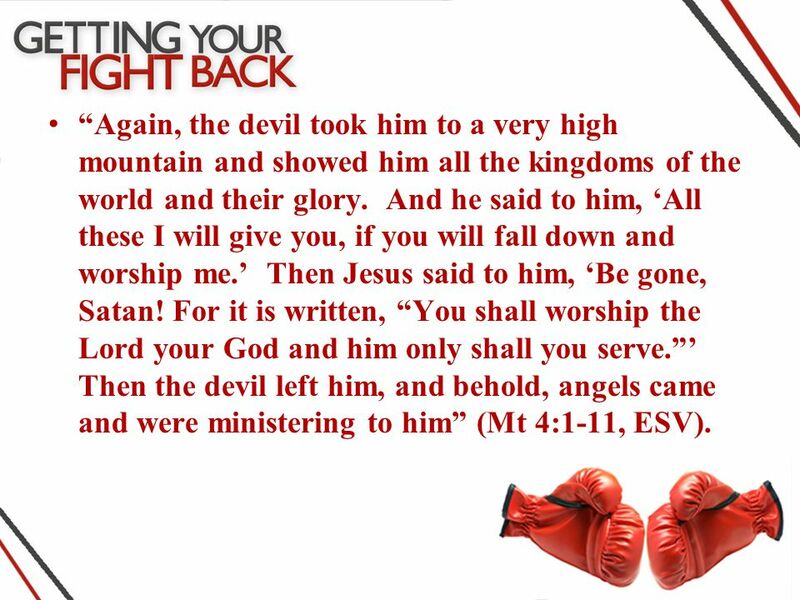 And he said to him, ‘All these I will give you, if you will fall down and worship me.’ Then Jesus said to him, ‘Be gone, Satan! For it is written, “You shall worship the Lord your God and him only shall you serve.”’ Then the devil left him, and behold, angels came and were ministering to him” (Mt 4:1-11, ESV). 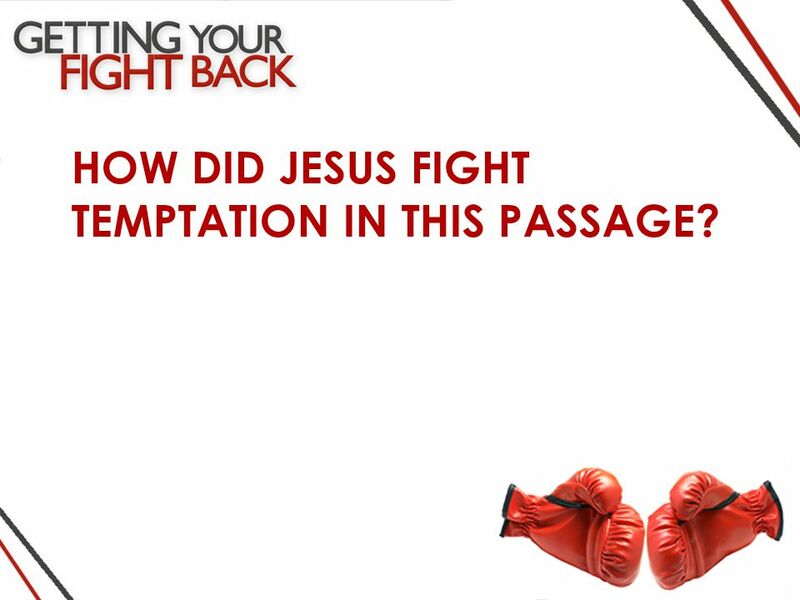 20 HOW DID JESUS FIGHT TEMPTATION IN THIS PASSAGE? 21 Jesus knew the Scriptures. 22 – Every time Satan tempted Jesus, the Lord responded with Scripture. 23 Jesus knew the Scriptures. 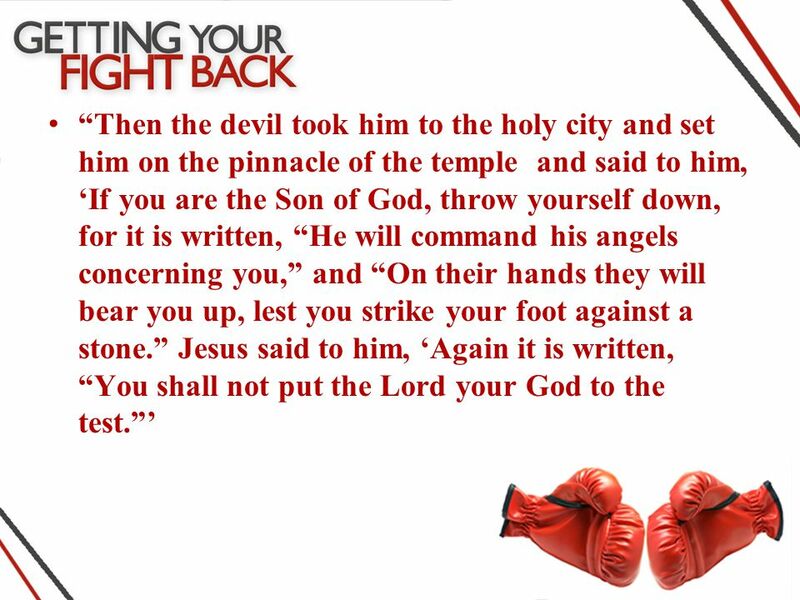 – Every time Satan tempted Jesus, the Lord responded with Scripture. – “I have stored up your word in my heart that I might not sin against you” (Ps 119:11, ESV). 24 Jesus wasn’t interested in his own pleasure. 25 – Can you imagine the reaction Jesus would have received if he had jumped off the temple? 26 Jesus wasn’t interested in his own pleasure. – Can you imagine the reaction Jesus would have received if he had jumped off the temple? – Can you imagine the temptation of being promised all the riches of the world? 27 Jesus wasn’t interested in his own pleasure. – Can you imagine the reaction Jesus would have received if he had jumped off the temple? – Can you imagine the temptation of being promised all the riches of the world? We fall into serious trouble when we give in to our pleasure. 28 Jesus wasn’t interested in his own pleasure. – Can you imagine the reaction Jesus would have received if he had jumped off the temple? – Can you imagine the temptation of being promised all the riches of the world? We fall into serious trouble when we give in to our pleasure. “Each person is tempted when he is lured and enticed by his own desire” (Js 1:14, ESV). 29 Jesus understood his purpose in life. 30 – “You shall worship the Lord your God and him only shall you serve” (Mt 4:10, ESV). 31 Jesus understood his purpose in life. – “You shall worship the Lord your God and him only shall you serve” (Mt 4:10, ESV). – “Fear God and keep his commandments, for this is the whole duty of man” (Eccl 12:13, ESV). 32 ARE YOU READY TO GET YOUR FIGHT BACK? 34 “Therefore I tell you, do not be anxious about your life, what you will eat or what you will drink, nor about your body, what you will put on. Is not life more than food, and the body more than clothing? Look at the birds of the air: they neither sow nor reap nor gather into barns, and yet your heavenly Father feeds them. Are you not of more value than they? And which of you by being anxious can add a single hour to his span of life? 36 “For the Gentiles seek after all these things, and your heavenly Father knows that you need them all. But seek first the kingdom of God and his righteousness, and all these things will be added to you. Therefore do not be anxious about tomorrow, for tomorrow will be anxious for itself. Sufficient for the day is its own trouble” (Mt 6:25- 34, ESV). 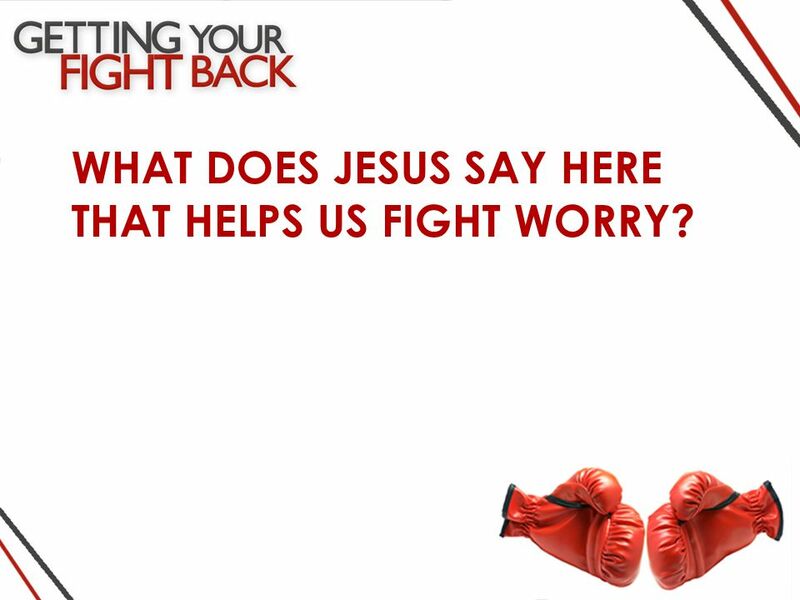 37 WHAT DOES JESUS SAY HERE THAT HELPS US FIGHT WORRY? 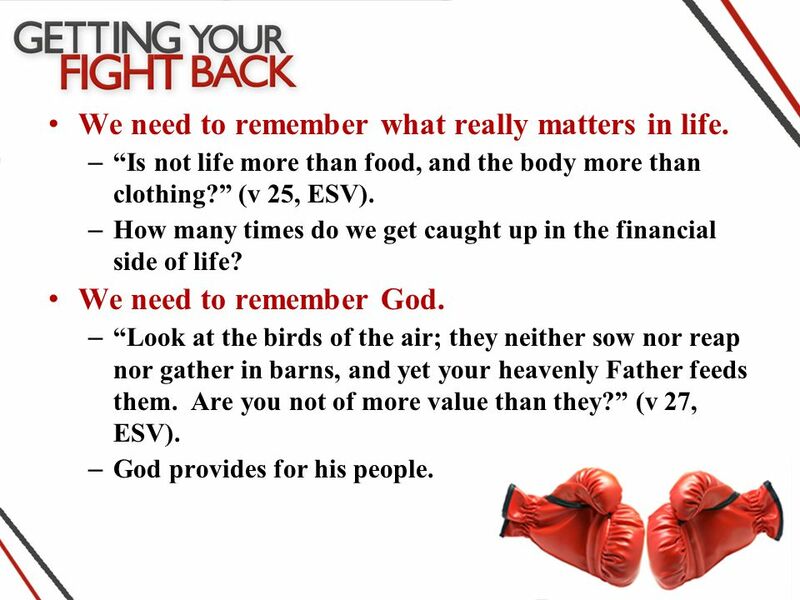 38 We need to remember what really matters in life. 39 – “Is not life more than food, and the body more than clothing?” (v 25, ESV). 40 We need to remember what really matters in life. – “Is not life more than food, and the body more than clothing?” (v 25, ESV). – How many times do we get caught up in the financial side of life? 41 We need to remember what really matters in life. – “Is not life more than food, and the body more than clothing?” (v 25, ESV). – How many times do we get caught up in the financial side of life? We need to remember God. 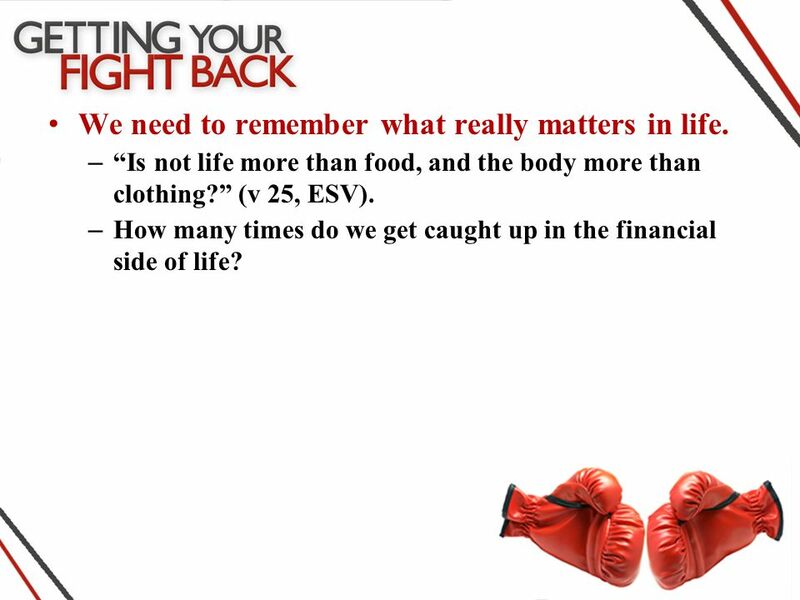 42 We need to remember what really matters in life. – “Is not life more than food, and the body more than clothing?” (v 25, ESV). – How many times do we get caught up in the financial side of life? We need to remember God. – “Look at the birds of the air; they neither sow nor reap nor gather in barns, and yet your heavenly Father feeds them. Are you not of more value than they?” (v 27, ESV). 43 We need to remember what really matters in life. – “Is not life more than food, and the body more than clothing?” (v 25, ESV). – How many times do we get caught up in the financial side of life? We need to remember God. – “Look at the birds of the air; they neither sow nor reap nor gather in barns, and yet your heavenly Father feeds them. Are you not of more value than they?” (v 27, ESV). – God provides for his people. 44 “Seek first the kingdom of God and his righteousness, and all these things will be added to you” (v 33, ESV). 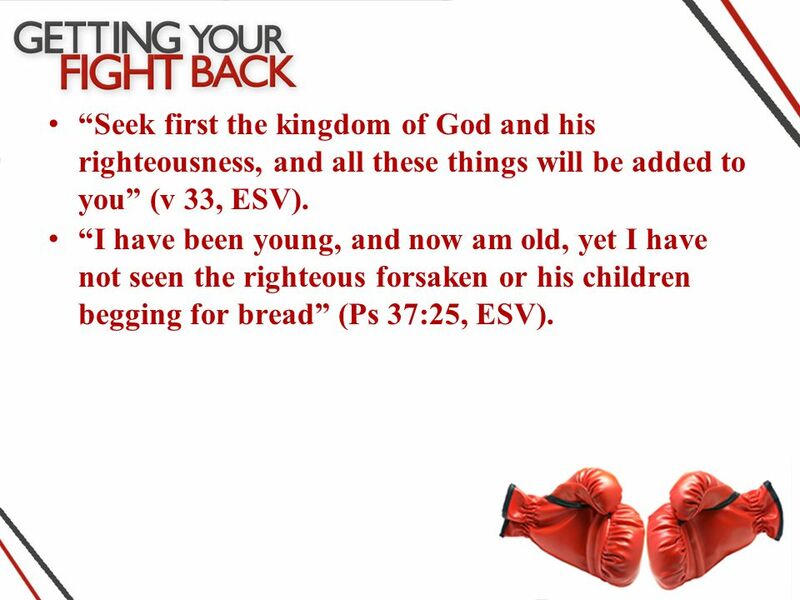 45 “I have been young, and now am old, yet I have not seen the righteous forsaken or his children begging for bread” (Ps 37:25, ESV). 46 We need to remember what really matters in life. – “Is not life more than food, and the body more than clothing?” (v 25). – How many times do we get caught up in the financial side of life? 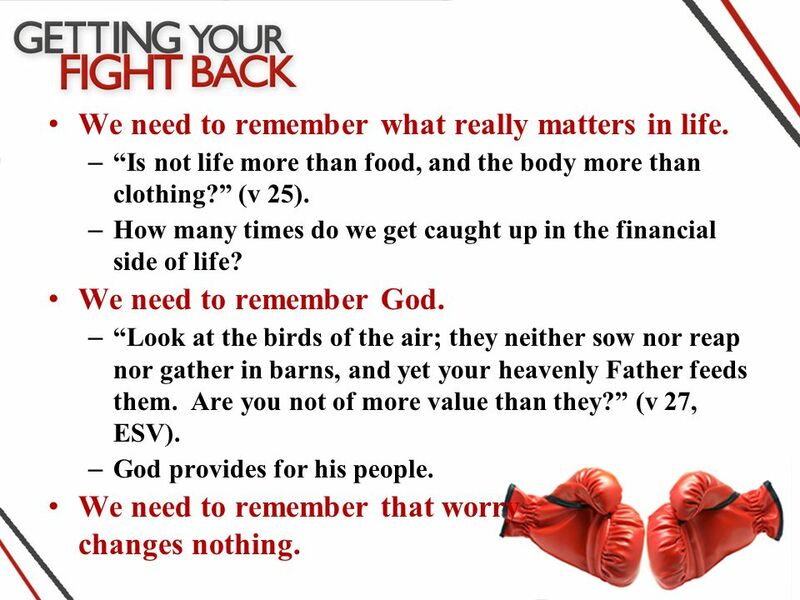 We need to remember God. – “Look at the birds of the air; they neither sow nor reap nor gather in barns, and yet your heavenly Father feeds them. Are you not of more value than they?” (v 27, ESV). – God provides for his people. We need to remember that worry changes nothing. 47 ARE YOU READY TO GET YOUR FIGHT BACK & FIGHT WORRY? 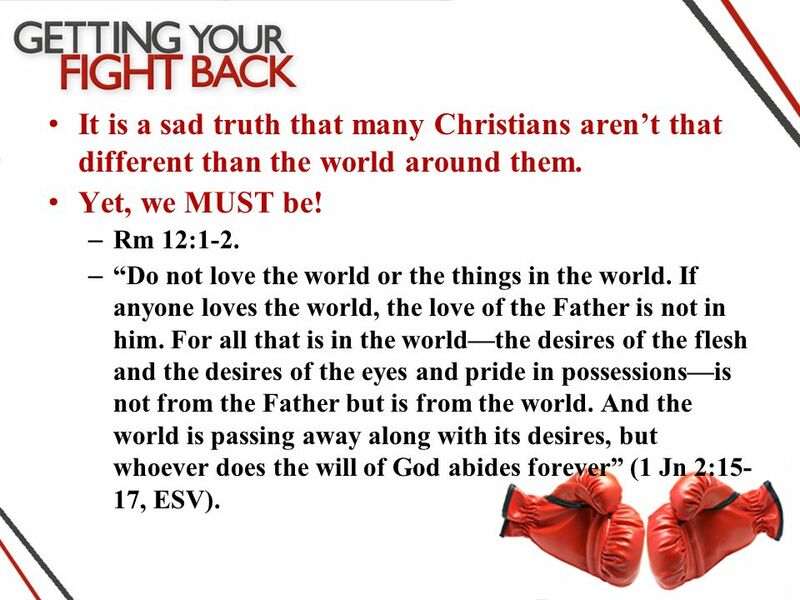 49 It is a sad truth that many Christians aren’t that different than the world around them. 50 Yet, we MUST be! 51 It is a sad truth that many Christians aren’t that different than the world around them. Yet, we MUST be! 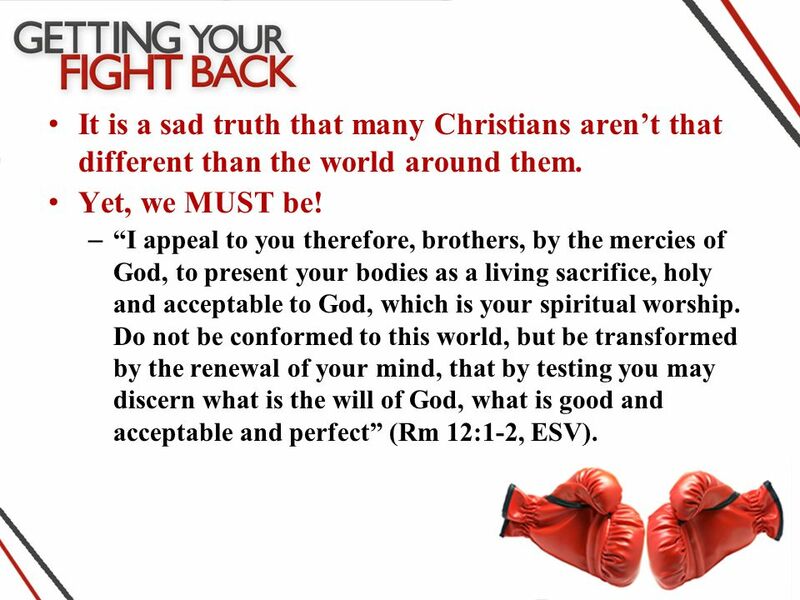 – “I appeal to you therefore, brothers, by the mercies of God, to present your bodies as a living sacrifice, holy and acceptable to God, which is your spiritual worship. Do not be conformed to this world, but be transformed by the renewal of your mind, that by testing you may discern what is the will of God, what is good and acceptable and perfect” (Rm 12:1-2, ESV). 52 It is a sad truth that many Christians aren’t that different than the world around them. Yet, we MUST be! – Rm 12:1-2. – “Do not love the world or the things in the world. If anyone loves the world, the love of the Father is not in him. For all that is in the world—the desires of the flesh and the desires of the eyes and pride in possessions—is not from the Father but is from the world. And the world is passing away along with its desires, but whoever does the will of God abides forever” (1 Jn 2:15- 17, ESV). 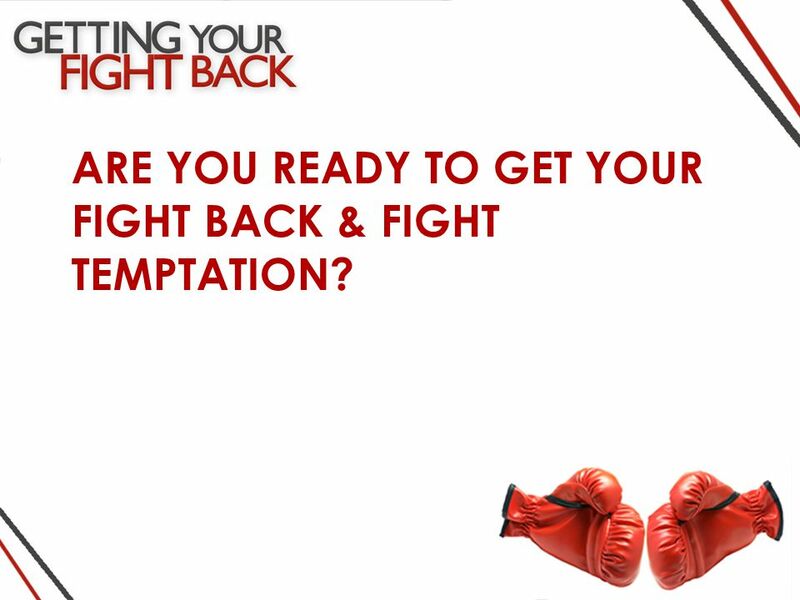 54 ARE YOU READY TO GET YOUR FIGHT BACK & FIGHT TEMPTATION? 56 Discouragement is one of Satan’s most powerful weapons. 57 – “Lift your drooping hands and strengthen your weak knees, and make straight paths for your feet, so that what is lame may not be put out of joint but rather be healed” (Heb 12:12-13, ESV). 58 Discouragement is one of Satan’s most powerful weapons. – “Lift your drooping hands and strengthen your weak knees, and make straight paths for your feet, so that what is lame may not be put out of joint but rather be healed” (Heb 12:12-13, ESV). – Some biblical characters faced serious discouragement. 60 Elijah: – After he conquered the prophets of Baal at Mt. 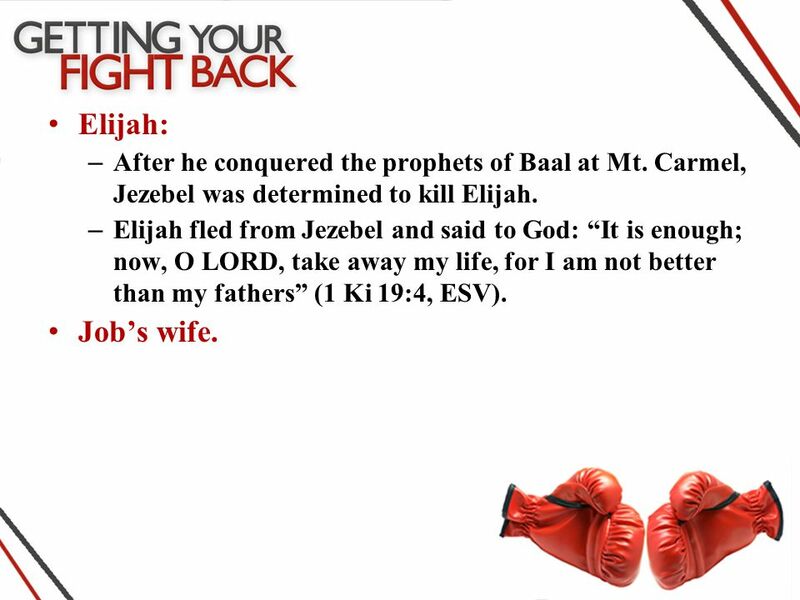 Carmel, Jezebel was determined to kill Elijah. 61 Elijah: – After he conquered the prophets of Baal at Mt. Carmel, Jezebel was determined to kill Elijah. – Elijah fled from Jezebel and said to God: “It is enough; now, O LORD, take away my life, for I am not better than my fathers” (1 Ki 19:4, ESV). 62 Elijah: – After he conquered the prophets of Baal at Mt. Carmel, Jezebel was determined to kill Elijah. – Elijah fled from Jezebel and said to God: “It is enough; now, O LORD, take away my life, for I am not better than my fathers” (1 Ki 19:4, ESV). Job’s wife. 63 Elijah: – After he conquered the prophets of Baal at Mt. 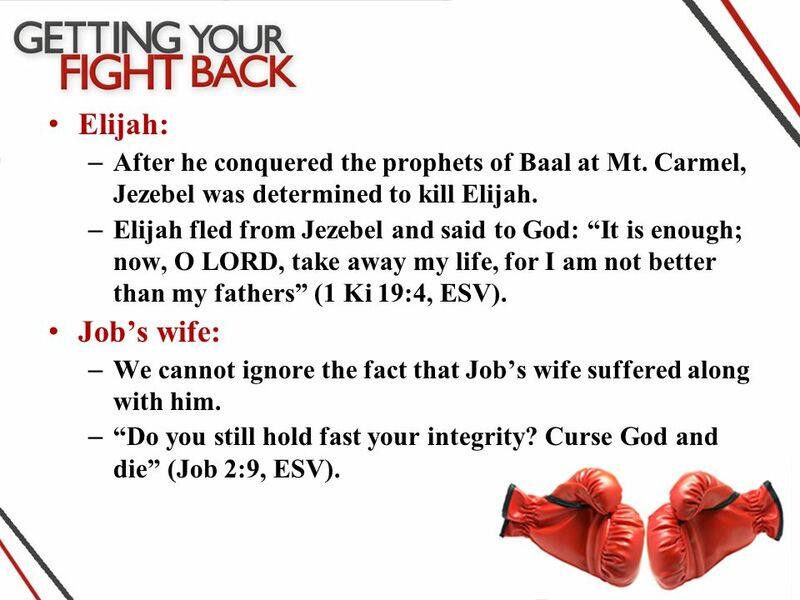 Carmel, Jezebel was determined to kill Elijah. – Elijah fled from Jezebel and said to God: “It is enough; now, O LORD, take away my life, for I am not better than my fathers” (1 Ki 19:4, ESV). Job’s wife: – We cannot ignore the fact that Job’s wife suffered along with him. 64 Elijah: – After he conquered the prophets of Baal at Mt. Carmel, Jezebel was determined to kill Elijah. – Elijah fled from Jezebel and said to God: “It is enough; now, O LORD, take away my life, for I am not better than my fathers” (1 Ki 19:4, ESV). Job’s wife: – We cannot ignore the fact that Job’s wife suffered along with him. – “Do you still hold fast your integrity? Curse God and die” (Job 2:9, ESV). 65 HOW CAN A CHRISTIAN FIGHT DISCOURAGEMENT? 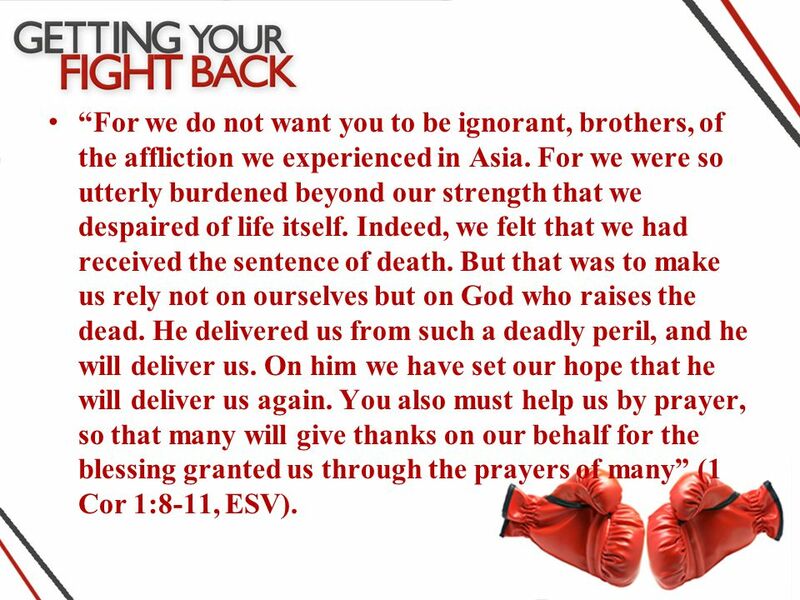 66 “For we do not want you to be ignorant, brothers, of the affliction we experienced in Asia. For we were so utterly burdened beyond our strength that we despaired of life itself. Indeed, we felt that we had received the sentence of death. But that was to make us rely not on ourselves but on God who raises the dead. He delivered us from such a deadly peril, and he will deliver us. On him we have set our hope that he will deliver us again. You also must help us by prayer, so that many will give thanks on our behalf for the blessing granted us through the prayers of many” (1 Cor 1:8-11, ESV). 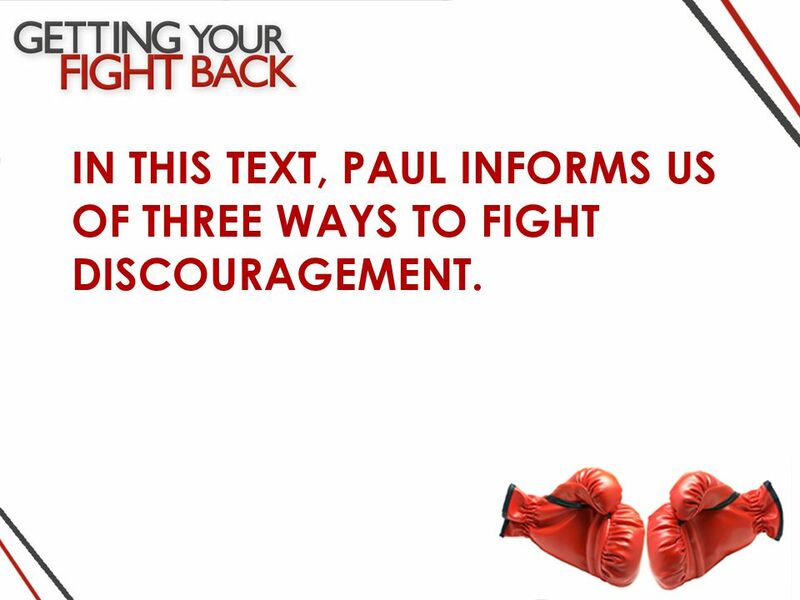 67 IN THIS TEXT, PAUL INFORMS US OF THREE WAYS TO FIGHT DISCOURAGEMENT. 68 We understand the purpose of suffering. 69 – Paul says that his suffering was to make him rely on God. 70 We understand the purpose of suffering. 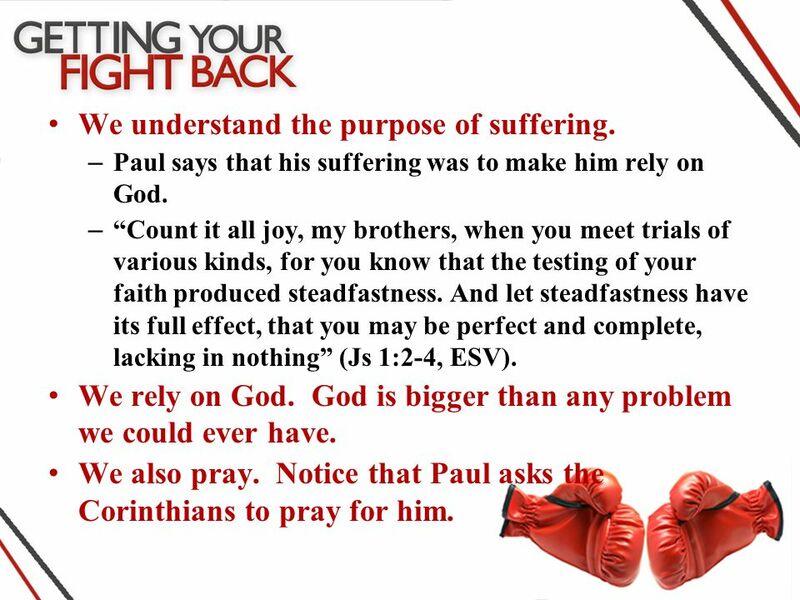 – Paul says that his suffering was to make him rely on God. – “Count it all joy, my brothers, when you meet trials of various kinds, for you know that the testing of your faith produced steadfastness. And let steadfastness have its full effect, that you may be perfect and complete, lacking in nothing” (Js 1:2-4, ESV). 71 We understand the purpose of suffering. – Paul says that his suffering was to make him rely on God. – “Count it all joy, my brothers, when you meet trials of various kinds, for you know that the testing of your faith produced steadfastness. And let steadfastness have its full effect, that you may be perfect and complete, lacking in nothing” (Js 1:2-4, ESV). We rely on God. 72 We understand the purpose of suffering. – Paul says that his suffering was to make him rely on God. – “Count it all joy, my brothers, when you meet trials of various kinds, for you know that the testing of your faith produced steadfastness. And let steadfastness have its full effect, that you may be perfect and complete, lacking in nothing” (Js 1:2-4, ESV). We rely on God. God is bigger than any problem we could ever have. 73 We understand the purpose of suffering. – Paul says that his suffering was to make him rely on God. – “Count it all joy, my brothers, when you meet trials of various kinds, for you know that the testing of your faith produced steadfastness. And let steadfastness have its full effect, that you may be perfect and complete, lacking in nothing” (Js 1:2-4, ESV). We rely on God. God is bigger than any problem we could ever have. We also pray. 74 We understand the purpose of suffering. – Paul says that his suffering was to make him rely on God. – “Count it all joy, my brothers, when you meet trials of various kinds, for you know that the testing of your faith produced steadfastness. And let steadfastness have its full effect, that you may be perfect and complete, lacking in nothing” (Js 1:2-4, ESV). We rely on God. God is bigger than any problem we could ever have. We also pray. Notice that Paul asks the Corinthians to pray for him. 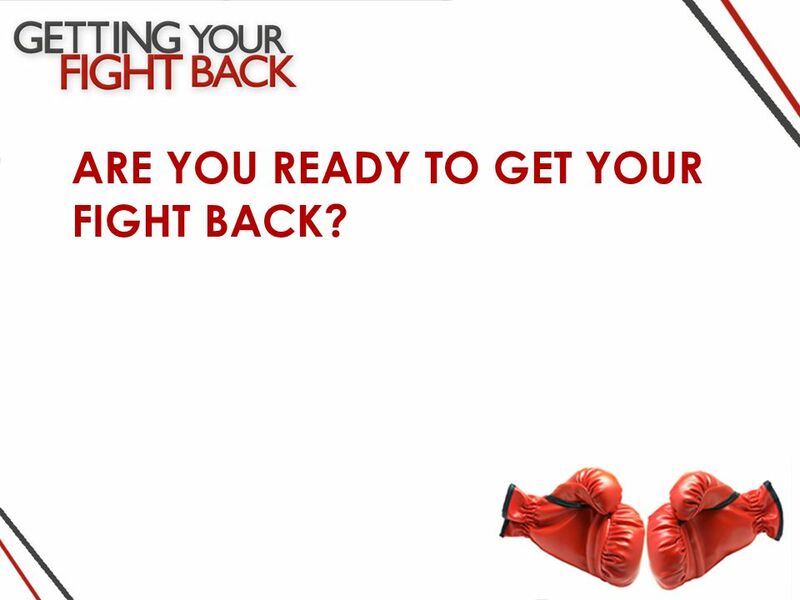 75 ARE YOU READY TO GET YOUR FIGHT BACK? Download ppt "2 Tm 4:7. 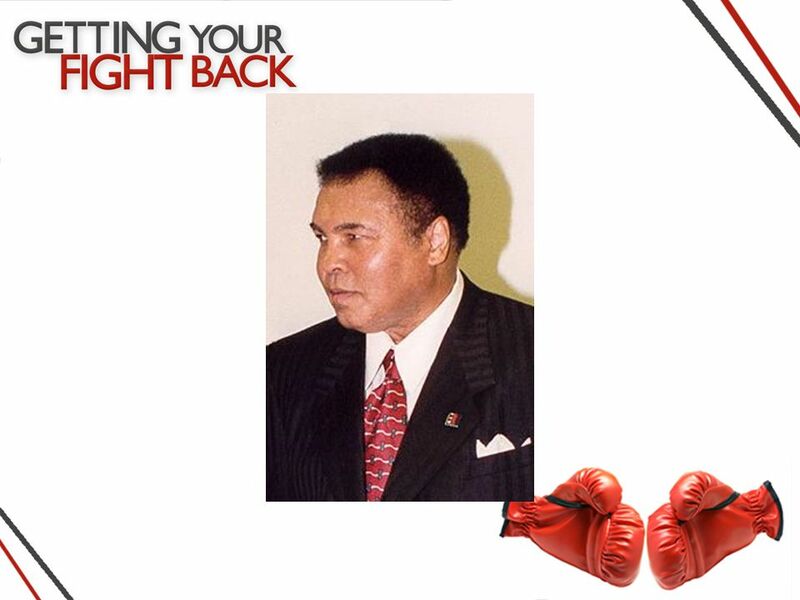 Boxing is one of the oldest games in the Olympics." 2 Corinthians 11:28.  Romans 1:14  Acts 15:36  Acts 18:23  Acts 20:2  Colossians 2:1. Then Jesus came from Galilee to the Jordan to John, to be baptized by him. John would have prevented him, saying, “I need to be baptized by you, and do. Set Free Give Up Woke up worrying Matthew 6 and 7. What does Jesus think about worry? 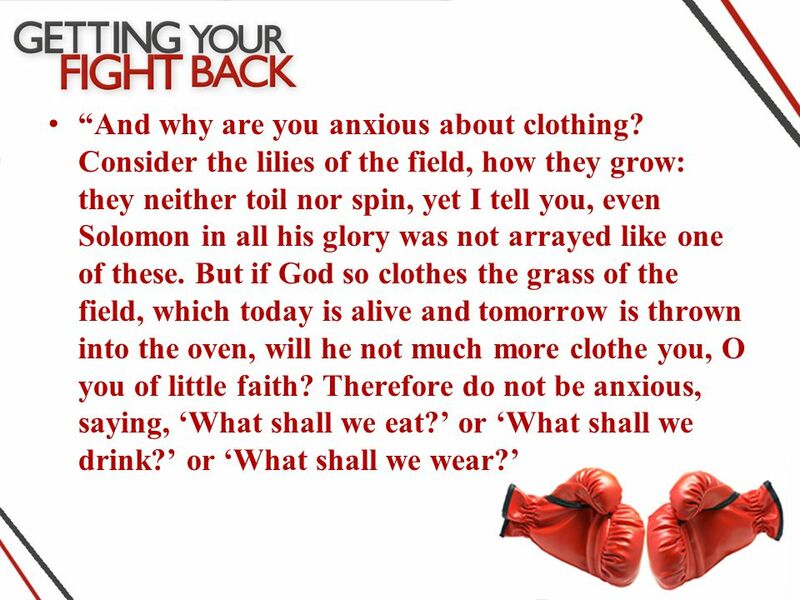 Matthew 6:25-34 “So I tell you to stop worrying about what you will eat, drink, or wear. Isn't life more than food. Spiritual Self Defense (Mastering the Tactics of Spiritual Warfare) Part 7: Deploy the Double Edged Dominance of God’s Word Chinese Grace Bible Church. Summary of Last time: Verses 7 & 8 Matthew 6:7 & 8 7 "And when you are praying, do not use meaningless repetition as the Gentiles do, for they suppose. What It Means to be a Christian. Ephesians 2:4-8 4 But God, who is rich in mercy, because of His great love with which he loved us, 5 Even when we were. GOD & MAN A Relationship for All-Time Lesson 3: The Problem of Sin. Kingdom Prayer: Lead Us NOT Into Temptation Pastor Timothy Chan Chinese Grace Bible Church Sunday, March 18, 2012. Proverbs 12:25 25 Anxiety in a man’s heart weighs him down, but a good word makes him glad. Mark 1: The Sinless Savior and Conquering King. Read through the following slides that tell the story of Jesus’ 40 days in the wilderness. It is taken from the Gospel of Matthew, Chapter 4:1-11. The Shepherd and His Sheep Psalm 23: The L ORD is my shepherd; I shall not want. 2 He makes me to lie down in green pastures; He leads me beside. Luke 4 – Jesus in the Wilderness CLASH OF TITANS. 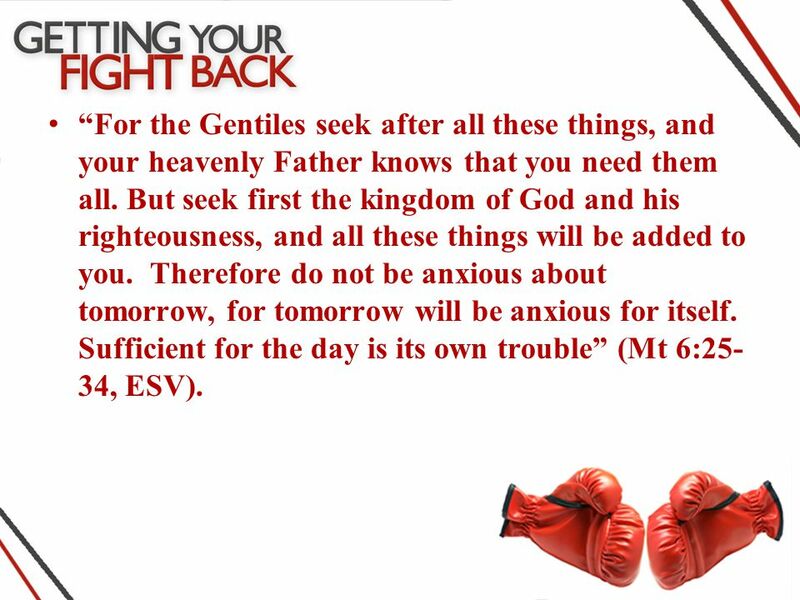 Matthew 6. The Old Testament Law The Ten Commandments The Case Laws Laws regarding worship Cursings and Blessings The Sermon on the Mount The Beatitudes. 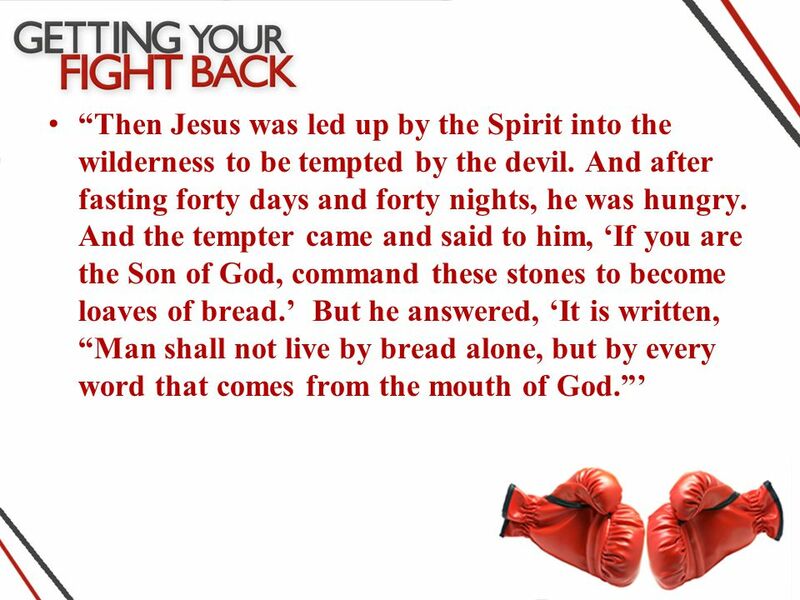 The Temptation of Jesus Matthew 4: Then Jesus was led up by the Spirit into the wilderness to be tempted by the devil. 2 And after fasting forty. THE LIFE OF CHRIST PART 9. Hebrews 2:17-18 Therefore he had to be made like his brothers in every respect, so that he might become a merciful and faithful high priest in the service.